Council family following awa ceremony presented by the American Samoa government to traditionally welcome the Council family to American Samoa prior to the opening of the 171st Council meeting. 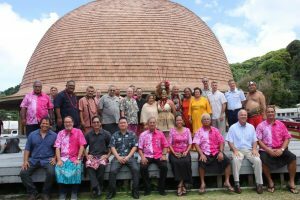 UTULEI, AMERICAN SAMOA (18 October 2017) The Western Pacific Regional Fishery Management Council opened its 171st meeting yesterday at the Rex Lee Auditorium in Utulei, American Samoa, with remarks from Gov. Lolo Moliga about the Territory’s fisheries followed by remarks about the nation’s fisheries by Samuel Rauch III, NOAA Fisheries Deputy Assistant Administrator for Regulatory Programs. Revise the North America Free Trade Agreement. Gov. Moliga recognized the Council’s efforts to support fishing infrastructure development and ongoing litigation over a final rule that would open a portion of the American Samoa Large Vessel Prohibited Area (LVPA) to American Samoa longline vessels. The Council recommended creation the LVPA in 2002 and an amendment to open a portion of it in 2015 to address changes in the fisheries and the need to meet national criteria for optimal yield. Rauch’s remarks focused on the importance of fisheries to the “fabric of our communities.” He said it “defines who we are in many of our coastal communities.” He lauded the Regional Fishery Management Council system’s strength in providing a forum for an open honest debate, which has been “phenomenally successful across the country.” He said Secretary of Commerce Wilbur Ross has repeatedly talked about the US seafood trade deficit and has asked NOAA for ways to address it. Fisheries account for the majority of the America Samoa’s gross domestic product and represent the largest private-sector employer. Recently, one of two tuna canneries in the Territory closed due to lack of fish supply and access to fishing grounds among other factors. One hundred percent of the local longline catch is delivered to the local StarKist cannery. The US seafood trade deficit is estimated to be about $11 billion, with the US importing about 80 percent of the seafood it consumes. The Council will continue its meeting in at the Rex Lee Auditorium on Oct. 18 and 19. For the full agenda and additional information, go to www.wpcouncil.org/category/upcoming-council-and-advisory-body-meetings/ or email info@wpcouncil.org or phone (808) 522-8220. Western Pacific Regional Fishery Management Council: Secretary of Commerce appointees from nominees selected by American Samoa, CNMI, Guam and Hawai`i governors:Edwin Ebisui Jr. (chair); Michael Duenas, Guam Fishermen’s Cooperative Association (Guam) (vice chair); John Gourley, Micronesian Environmental Services (CNMI) (vice chair); Christinna Lutu-Sanchez, commercial fisherman (American Samoa) (vice chair); Michael Goto, United Fishing Agency (Hawai’i); Dean Sensui, film producer (Hawai’i); Archie Soliai, StarKist (American Samoa). Designated state officials: Suzanne Case, Hawai`i Department of Land & Natural Resources; Ray Roberto, CNMI Department of Lands and Natural Resources; Matt Sablan, Guam Department of Agriculture; Henry Sesepasra, American Samoa Department of Marine & Wildlife Resources. Designated federal officials (voting): Michael Tosatto, NMFS Pacific Islands Regional Office. Designated federal officials (non-voting): Matthew Brown, USFWS; Michael Brakke, US Department of State; RADM Vincent B. Atkins, USCG 14th District.